Green tea’s subtle yet complex flavors are well worth the process of brewing the perfect cup of tea. This begins with a high quality, fresh green tea in loose leaf form. The difference between a tea bag and a loose leaf tea is most easily measured with green tea’s. Green tea bags often contain low quality tea leaves or much older. A high quality loose leaf tea is easier to inspect, you hold the whole tea leaves in your hand, not a semi-translucent bag filled with the dust of who knows what. Loose leaf can vary greatly in quality, just like it can vary from the quality in bagged teas. Let’s suggest one tea in particular that’s a great place to start, and then if you’re curious in learning about more options out there and exploring a bit deeper, check out this page. This is a delightful tea. 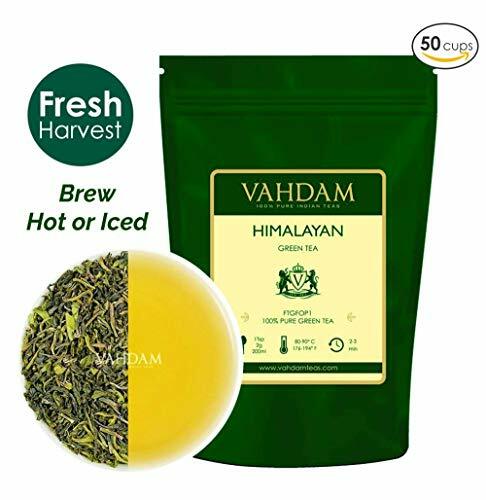 It’s great quality, ethically sourced by our friends at Vahdam, and a perfect entry point to expand your tea tasting, especially if you’re making the switch from bagged. This is an organic loose leaf green tea from a great brand, it has a nice blend of flavors, and is very reasonably priced considering the quality. Green tea is not only a delicious drink, it is an experience, a piece of history reaching to ancient times. The focus and tranquility that go into brewing the perfect cup is without equal. I will cover the steps involved in brewing a perfect cup of tea, while they aren’t that special individually, when combined into the perfect brew it is serene. Source a high quality, preferably organic loose leaf green tea. Choose your favorite variety, a roasted Chinese green tea, or perhaps a more potent Japanese green. Boil your water (distilled preferably, but anything with a clean taste) and let it sit for a few minutes to cool off. Pouring boiling water on your tea leaves will burn them and cause a bitter taste to ruin your brew. While you wait for your water to cool slightly, pick out your favorite tea cup and warm it under the tap. This ensures the water doesn’t cool down too quickly when poured into your cup. Put a large pinch, or roughly 1-1.5 teaspoons of loose green tea leaves in your tea infuser, gently lower into the water in your cup. Let it steep for 3-5 minutes and remove the infuser. Sit back and enjoy your perfectly brewed cup of tea. While none of these steps are drastically different from any other cup of tea, subtle things like water temperature and length of the steep will change your tea completely. Avoid ruining your tea with water that is too hot or forgetting to remove the infuser, causing your tea to develop a fowl bitter flavor. While many serious tea drinkers out there prefer loose tea in general, its not to say all bagged tea is bad. Its simply harder to tell what your getting, so it is important to source your tea bags from a trusted supplier. Try out the process of brewing a loose leaf green tea and you will have a flavor profile to compare your tea bags to and you can decide for yourself.